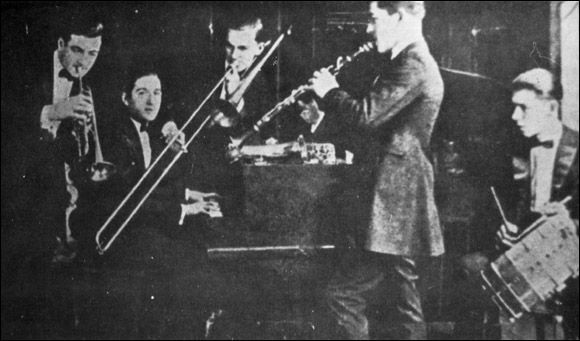 October 3rd in Gennett History, 1923: Ladds Black Aces recorded “All Wrong” in NYC. The recording appeared on Gennett 5272 and Starr-Gennett 9472. The band featured Phil Napoleon (c), Charlie Panelli (tb), Jimmy Lytell (cl), Frank Signorelli (p), and Jack Roth (d). This entry was posted in Gennett, October and tagged Charlie Panelli, Frank Signorelli, Gennett, Gennett 5272, Gennett Discography, Gennett Records, Jack Roth, Jimmy Lytell, Ladd's Black Aces, October, Phil Napoleon, Starr-Gennett 9472. Bookmark the permalink.